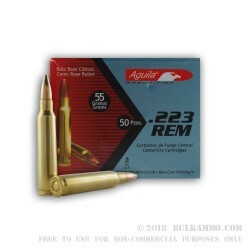 This 223 ammo is perfect for your AR-15 and it is manufactured by Industrias Tecnos S.A. De C.V. - they were established in Mexico in 1961 by Remington - and is premium quality ammo. Sold under their Aguila (Eagle) brand, Industrias Tecnos are manufacturers of ammo for the Mexican military and police forces and also sell ammo in the Middle East, South America, and Europe. The plant did originally produce some Remington ammo and the staff was partially trained by Remington. 250 rounds downrange. No misfires and very tight shot groups. I have shot about 200 rounds so far without one problem. 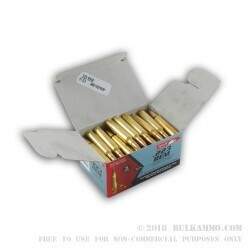 I will use Bulk Ammo again and I always start with Bulk Ammo when I am looking for the best price and for the most part they always come through. Good practice ammo if you prefer brass. Best stuff on the planet! .223 ammo is so popular that it was getting back ordered on several websites and over priced. Q: Are the bullets made out of 100% lead with copper jacket? A: The bullets are composed of a lead core with a copper jacket. Steel is not used so this will not be attracted to a magnet. 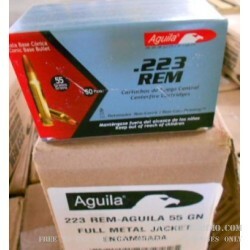 If you are shooting indoors with steel restrictions, this Aguila ammo is an excellent choice! Q: Does this ammo use non corrosive powder? A: Correct. Aguila does not load their ammunition with any corrosive components. Additionally, their brass is boxer primed which may be used for reloading. A: Yes, this Aguila ammunition is factory new, and high quality. A: Yes, this Aguila .223 ammo is loaded with boxer primed brass cases that are excellent for reloading.